Toshiba's Satellite range is firmly aimed at the home user, with models to suit all budgets. 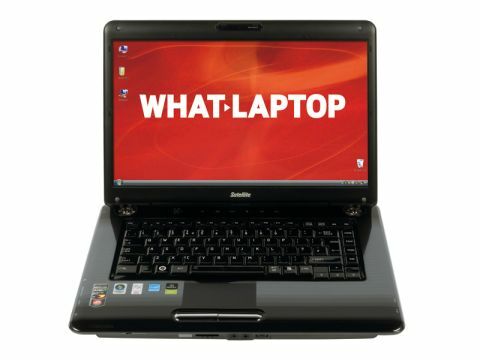 The Satellite A350-11N (£529 inc. VAT) is an entry-level multimedia laptop which boasts a great screen and good usability. Unfortunately, it's let down by poor 3D performance, which rather limits its multimedia abilities and places it behind many of its competitors in the order of things. The 17-inch screen offers mixed quality. Its widescreen 16:9 aspect ratio makes it fantastic for watching films, but the 1366 x 768-pixel resolution isn't as sharp as we'd have liked. This means you won't be able to view any more windows onscreen than you would on smaller rivals, limiting its usefulness. As with all Super-TFT screens, reflections are an issue. This is especially the case in changing light conditions. A powerful graphics card is crucial in a multimedia laptop, as it enables the running of resource-intensive applications, such as photo editing software. In order to keep costs down, this machine features an integrated Intel GPU instead. While watching movies doesn't cause any issues, it means that gaming isn't an option. The 2.9kg chassis is reasonably light for a machine of this size and features a glossy design. While it looks smart, it's a magnet for scratches and scuffs, making a protective case necessary if you're planning to travel with the laptop. The keyboard meets the usual high standards set by Toshiba. The keys are responsive, smooth and large, providing a very fluid typing action, although Toshiba has given the keys a glossy design, which makes them impossible to keep clean. The board is also poorly mounted on the chassis and, as a result, the central keys flex under light pressure. A row of touch-sensitive hotkeys run along the top of the keyboard, giving you immediate control over your CDs or DVDs. Intel's 2GHz Core 2 Duo T5800 processor is bolstered by a generous 4096MB of memory, ensuring that multi-tasking isn't an issue. During our extensive tests, the system showed lag only when running multiple applications, running smoothly at all other times. Three USB ports provide room for your peripherals, and an eSATA interface facilitates fast data transfers with an external hard drive. The inclusion of an analogue-only VGA port over an HDMI port, for connecting an external display betrays this machine's budget roots, and prevents you from connecting to an HDTV. Overall, the Toshiba Satellite A350 is a competent laptop for light multimedia use. The lack of a dedicated graphics card is a flaw, however, and could be enough to force people to look elsewhere.